So… as I sat at the table this afternoon eating my lunch, I realized that I needed a new game plan for my approach to this here blog. Our camera is still dead and, since we had to buy new tires for the car this weekend, there isn’t really a chance of replacing it anytime soon. I’m still using our video camera to take pictures, but they’re super-low light and definitely need some editing – which makes for a big problem since I’m currently having trouble with the latest version of Adobe Creative Suite that I loaded about a month ago. Somehow, it thinks I already have it loaded on two computers that don’t include our desktop. Silly electronic licensing. It is loaded on my desktop – that’s the second! Regardless, until I get that figured out, there is little chance for my own pictures to make their way onto the blog. The result is that I’ve tried to figure out a way around that, and I’m going to use other people’s pictures as much as I can. 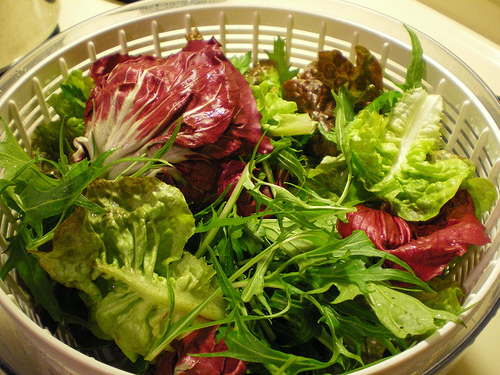 We buy the pound tubs of mixed salad greens because we find we can get 4-5 meals out of them. It’s a lot of greens for two people and about $6. Sometimes, if they’re on sale, you can get ’em for $4-5. This really helps stretch your meals and your budget. The big tubs (or bags, but I prefer the tubs since the bags aren’t typically re-sealable) come in a variety of types of greens, so even if you’re not a fan of the crazy bits and pieces pictured above, you can still go with a tub of romaine or spinach that will give you more nutrition than a head of iceberg. Good veggies are key when it comes to a salad. I love bell peppers more than I probably should (and more than Chris would like me to). I’ll go out of my way to find good deals on peppers, usually at stores that are more like local farmers’ markets than supermarkets. Sometimes the bigger chains will have 10 peppers for $10 or something like that, but most of the time any color other than the greens can be $2-3 apiece. That’s why I like places like Sprout’s or Sunflower. 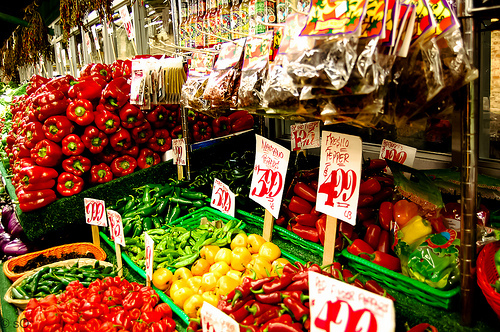 Most of the time, reds, yellows, and oranges aren’t more than $1 apiece, and they often run specials like 3 reds for $1. That’s when I definitely know we’re having salads for the week. I stock up on peppers, go home and chop them up all at the same time. and store them in a plastic container in the fridge. This is a great game plan for your veggies. If you know you’re going to be eating a bunch of them over the course of the week, come home from the store, rinse everything off, chop everything as small as you need it for the week and store it in various plastic containers. It makes preparation the day of a ton easier, and while it may take a while to chop everything, you’re only washing the cutting board and knives once. Totally a great thing for me. Other veggies that are great: carrots, celery, tomatoes (if you like that sort of thing), snap or snow peas, avocado, cucumber… pretty much anything that you like to throw on a salad is fair game. And the great part about veggies is that most of them are nearly calorie-free since they are primarily made up of water – a great way to get full without empty calories. First confession: I am a carbohydrate, cheese, and salad dressing junkie. It is a problem. One thing that I’ve been finding, however, as I’ve continued in trying to lose weight is that those three things are what can give me a good day or a bad day – and they can stretch a lot further than I think they can. Second confession: I have become one of those people who measure things out. I’m not always exact, grabbing for the nearest measuring device (who wants to clean extra things every day? Not me! ), but I have gotten used to eye-balling and knowing how much my fingers can pick up of dry goods. Get to know the information on pre-packaged products. It’s good to realize that two tablespoons of something might contain 60 calories, but will be perfectly sufficient in adding that extra bit of salty crunch that us carbohydrate lovers crave. Likewise will two tablespoons of dressing be sufficient for a dinner-size salad, and just one for a side salad. The empty calories are where restaurant salads, and sometimes even homemade ones if you’re not careful, can easily turn from something healthy to I-should’ve-just-eaten-a-burger-and-fries. I love Fresh Gourmet’s tortilla and wonton strips – we use them on just about every salad we make. 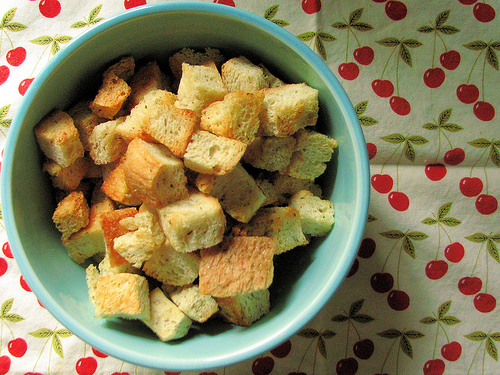 They also have good crouton varieties if you’re a crouton person. Since they’re not really greasy, they make great additions that I can still feel good about. The other killer of healthy meals is salad dressing. Vinaigrette dressings are typically lower-calorie than cream-based dressings, but some types of salads call for that lovely helping of ranch. Just be careful. Measure if you’re uncertain as to how much you’re adding. A good salad dressing swap out and portion can easily take off 100 calories. Remember, two tablespoons is more than sufficient! A tablespoon or two of cheese also goes a long way, especially if it’s shredded. If we’re having salads for the week, I’ll often buy a pound or two of the shredded cheese that goes the best with most of the salads I plan to make. Some can eat a salad for dinner without needing protein. I am not one of those people. One of the things that I love most about salads is that they can easily stretch our proteins – particularly when they are more on the expensive side. Find good marinades. If you want, cook meats in advance and store in plastic containers in your fridge. Make the most of the leftover lunch meat from your lunches. There are a lot of ways to get a good source of protein and, as long as you don’t suddenly have the urge to fry your protein, there are a lot of great ways to use spices and seasonings for great flavor that add very little calorically. Chicken: Chicken doesn’t have to be complicated. You don’t always need a good marinade, but if you have a favorite for chicken, go ahead and use it. Use leftovers. Take a thawed or fresh boneless, skinless chicken breast piece and grill it on the George Foreman or outside (if you have a grill outside), or just put it in a skillet and cook it on the stovetop. There are a hundred ways to cook good chicken. I really like a good sprinkle of Chesapeake Bay style seasoning. Eggs: Not everyone is a fan of the hard-boiled egg, but I am. It’s a great, healthy, lower-calorie protein that works really well in most salads. Normally, you’ll only need one. Or try a fried or poached egg if you like those better. The yolks can mix some really great flavor in with your dressing. Fish & Seafood: Salmon, tilapia, shrimp, scallops, and just about anything that’s not terribly fishy (unless you like fishy fish) make for really great salads. It’s also a great way to get seafood without paying for a whole pound. For the two of us, we often buy one fillet of fish – which means $3-4 instead of $6-8. Beef: Beef can also make a great salad. With ground beef, add a packet of taco or fajita seasoning and make yourself some taco salads. We find we can get four salads out of a pound of ground beef this way. With a tri-tip or strip steak, find a good marinade and make an Asian-style salad. There’s a lot of variety with beef. Pork: Pork can be a little dry if you’re not careful. I find it’s best if it’s a roast cut that has been cooked in a slow cooker (like carnitas). Great for leftovers in this way. Avoid loin and chop cuts unless you’re really into pork, and make sure that you have a really great marinade to add flavor if you use those cuts. Lunch Meat: Deli meat can be a great, low-calorie option. Just take a slice or two, cut it up and add it to your salad. A simple way to use such things up before they go bad just sitting in your fridge. Taco Salad: Brown one pound of lean ground beef. Add packet of taco seasoning (like Old El Paso). For each person, put 2-3 cups of greens in a large bowl (not like a soup bowl – a large bowl) or on a plate, add 1/3 cup red bell peppers, 1-2 tablespoons mixed Mexican/mixed shredded cheese blend, 1 tablespoon each of sour cream and spicy ranch dressing (Hidden Valley makes a spicy ranch that is really good), and 2 tablespoons of Fresh Gourmet Santa Fe Style tortilla strips, and put 4 ounces (a 1/4 of the pound) of the meat on top. Mix and enjoy. About 550 calories per serving. Salmon Salad: We don’t always cook our fish with much seasoning. Salmon, specifically, has such a great flavor on its own that we just kind of let it be. We typically just make sure that there is some oil on both sides so that it doesn’t burn while cooking, sometimes mixing in some lemon juice or fresh herbs dependent upon what we have on hand. We prepare much the same salad as above (greens, peppers, cheese, other veggies), subbing Fresh Gourmet’s Garlic Ginger wonton strips (which I might be able to eat without ceasing) and a nice vinaigrette like roasted red pepper or sun-dried tomato. If we do an Asian marinade (like the “Asian Ginger Grill Marinade” from allrecipes.com), we sometimes use a balsamic or champagne vinaigrette (find light champagne dressing – it still tastes great, but has considerably fewer calories). If you use about 4 ounces of fish per salad, you end up with about 350 calories per serving. Steak Salad: Steak is a rare treat in our house and we try to make it stretch when we have it. 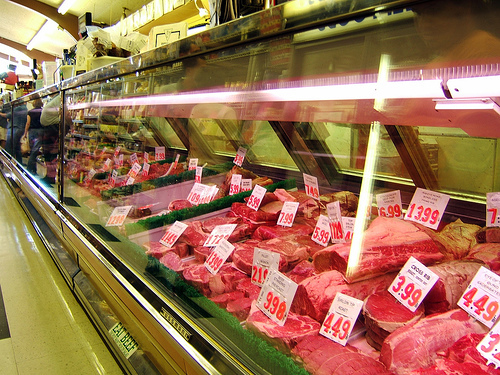 Often, we’ll look for a cheaper tri-tip on manager’s special or a good skirt steak or something good for marinating. We’re not too picky about our marinades unless it’s a special occasion, choosing vinaigrette salad dressings for a quick marinade before cooking. If it’s a special occasion, we might opt for something amazing and time-consuming like the “Tangerine Beef with Scallions” recipe from the Great Easy Meals cookbook. We typically use croutons or the Ginger Garlic wonton strips with steak, and a vinaigrette dressing instead of a cream-based one – naturally in the same proportions used in the salads above. Shredded mozzarella or a softer cheese like feta work really well with this type of salad. All sorts of veggies are great additions, resulting in about 400 calories per serving. A really long post, to be sure, but thanks for sticking with me. I didn’t used to consider salads as meals, but have been grateful for the variety they offer while not sacrificing flavor in my efforts to lose some weight. They can be really flexible, easy-to-prepare options that stretch your budget, your proteins, and your calorie count.